Brides from Russia and former Soviet Union countries are still very popular in the West. While at the same time more and more Russian girls would like to marry a foreigner. But as the industry expands it attracts increasing number of scammers that want to make money on other people's feelings. CuteOnly CEO Nikolay Pokrovsky tells about the countermeasures they take at CuteOnly against scammers and gives advice on how to recognize scammers in the altered present day situation. Not so long ago Russian girls were heading West in search of material welfare, and their marriages were more of a business deal than a love affair. The good news is that nowadays welfare could be attained here in Russia. So contemporary Russian women are not so much after the prosperity, but rather after the feelings of love and affection that are so hard to find in their homeland. According to the population census of 2002 there are 10 million less men in Russia than women. Due to the devaluation of family values most Russian men are not family oriented. Thus Russian belles are forced to seek husbands in the western world where men are traditionally more inclined to build strong families — women want a good marriage and kids born in love. On the other hand, with the expansion of the Internet it became a lot easier for Russian women to get acquainted with foreign men. If earlier Russian Internet dating was limited to go-between marriage agencies, and such were quite often light-fingered, then now most women can access the web independently from home, college or office. It opens a great opportunity for Internet communities such as CuteOnly where Russian girls can post their profiles without having to visit CuteOnly office. As a result of this, the number of active female customers of CuteOnly has increased from a few hundred to tens of thousands in less than 2 years. In order to initiate prosecution a victim has to do it himself or provide a Russian lawyer with a notarized letter of attorney to act on the victim's behalf. Costs in a criminal case usually exceed the sum pinched by the scammer. 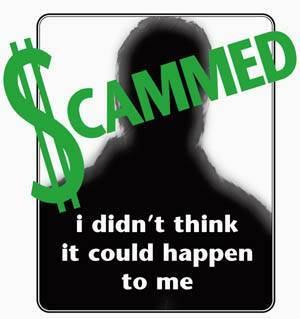 The bill of complaint has to be filed in the place of the scammer's permanent residence. Taking into view the vast territories of Russia, he or she could be living in the middle of nowhere or, say, somewhere in Siberia where it's impossible to find a lawyer that understands English. Even if the case is opened, this kind of fraud is particularly difficult to prove: if the scammer is a female, she can always admit the fact of receiving money and it won't even be considered a fraud — after all, men do give women presents, don't they? 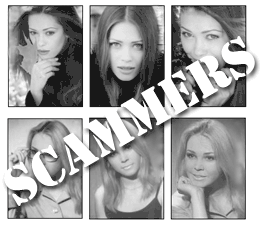 It's not making the case any easier when the scammer is a man: he would always have a female accomplice so that he could accept the monetary transfer to a female name. Russian law-enforcement authorities have no experience investigating such crimes, so the chances of success are rather low. Careful verification of CuteOnly female customers. At the registration stage it is required to provide an active phone number. Before profile activation we contact each girl over the phone in order to analyze not only her answers to our questions but also her reaction. If the provided number is wrong or out of use, we will not activate the profile. But experienced scammers sometimes are prepared for the telephone check, so some rare cases of scam may have place even at CuteOnly. Automatic keyword filtration of correspondence. Of course we do not read the correspondence of our customers. The checking algorithm works like this: if the filter detects in a given letter certain keywords that are typical for scammers, male customer receives an automatic notice from our support system warning him of a possible scam attempt and giving him advice on how to recognize if it really is scam. A girl declares her love in the first letters. For Russian ladies it's even less typical than, say, for Americans. A girl asks for money to pay for the internet, to take English lessons, to help sick relatives etc. Russia is not such a poor country anymore, and normal Russian girls don't ask for money from strangers. And finally to minimize the risks just obey one simple rule: never give cash! Do you know why scammers prefer Western Union? Because once the transfer has been received it's impossible to get the money back. After all, if you're growing so fond of your lady and you want her to come for a visit, you can order the airfare for her and pay it with a credit card.